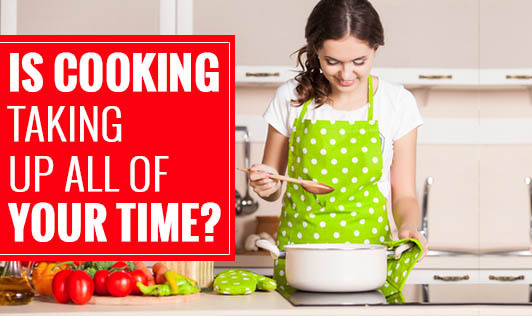 Is Cooking Taking Up All Of Your Time? Cooking can become a very tiring and time consuming task if not managed properly. It involves a lot of other tasks like planning, preparation, cooking, serving etc. Many people avoid cooking altogether because of simple reasons like poor time management. This leads to unhealthy lifestyle and dietary habits. • Plan your meal! Planning goes a long way in saving time and energy. Do not take a long time in planning. Just make a mental note of what you want to cook for breakfast/lunch or dinner. • Take a look at your pantry. See what ingredients you have before you plan. This will give you an idea of what you can cook and the time you will require. • Pre-prepare: If you have more time to cook breakfast and don't have much time for dinner, you can cut the vegetables required for dinner while making breakfast. • Multi task! This is one of the many things women excel at. So make good use of it! • Keep the ingredients ready. When you start cooking, keep all the required ingredients and vessels ready at your station. This will reduce the time spent on running around looking for the ingredients. • Keep your work area clean. This may not be directly related to reducing your cooking time, but it will definitely help in reducing cleaning time! • Work faster: This comes with experience. So do not stop cooking to save time. Instead, start cooking more!